A long, long, long, time ago, more than 75 million years ago, in the Lower Cretaceous Aptian, a river wound its way through an upper deltaic mud plain, in the present-day State of Mississippi, near the Louisiana eastern border in the USA Gulf Coast. As we all know, the Aptian was a time when dinosaurs and other creatures roamed along richly-vegetated river banks, swamps, and seashore. Away from water, the environment was hostile: grasses and flowering plants had not yet evolved and so the interior uplands were essentially barren. As with all major rivers making their way to the sea, they periodically carry large amounts of sediment. The sediment in this river carried and deposited not only muds, clays, and organic material but also well-sorted quartz sands. 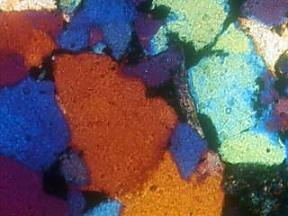 The whole sequence of many sand and shale members is called the Hosston Formation. Some of the thicker sandstone members have been named by geologists as: First Hosston, Diffrient, Forbes, BOE, Harper, Booth, Ivy, BOS, George, and Selman Sandstones, when first drilled in 1974 near the town of Bassfield located in Jefferson Davis County, Mississippi. So what does the fossil record tell us of this time and place? How does the geologist go about it? The geologist looks at many samples obtained from cuttings and cores from the drilling of deep wells, and uses a microscope and other tools to obtain detailed information concerning what the environment was like at that time. Based on petrological examination of the samples, the sands in Bassfield area are interpreted as having been laid down in a fluvial environment. The sequence is a series of stacked distributary channels and point-bars within a meandering river system. The base of a typical sand section in this area contains distributary channel sands. These quartz sands are light grey to brown, coarse to fine-grained, cross-bedded, and usually contain some basal conglomerates and pebble-sized grains. Further upsection, grain size decreases and cross-bedding angles increase upward throughout the deposit until another sandstone interval is encountered. This overlying sandstone deposit. Overlying this point-bar deposit are red to green-grey in colour, fine-grained, bioturbated siltstones. These sediments contain rootlet-moulds and mud balls, which are interpreted as river levee deposits. The distributary channel sands have a sharp erosional contact with the underlying interdistributary section. 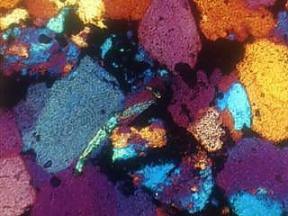 This section consists of siltstones, thin coal lenses, and clay deposits. These siltstones are reddish-brown to grey in colour and are fine grained, unimodal, and well-sorted. X-ray analysis revealed the average composition of the sandstone members to be 78% quartz, 10% dolomite, 8% kaolinite and 4% illite, with traces of calcite, mica, feldspar (plagioclase), siderite, and chlorite, montmorillonite, halite, and mixed-layer clays. Although the total composition percent of clays is not high, the clays are an important component of the rock. 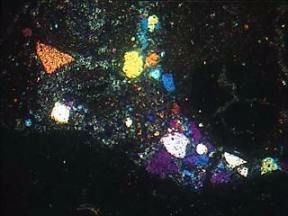 Of the clays, kaolinite had the highest percent content, usually concentrated in balls or lumps in the rock pore space. Other clay types were dispersed throughout the rock in minor amounts. Calcite in the form of ankerite was determined to be present as a major carbonate cement, while mica, feldspar, and siderite nodules were usually as framework grains. The clean quartzose sandstones contain the highest porosities and permeabilities. 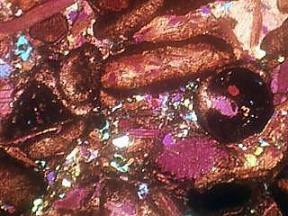 In some sandstone intervals, there are quartz overgrowths with some grains overcoated with kaolinite in the pore spaces. However, there was no kaolinite present in the pore throats. The kaolinite overcoating is considered indicative of an authigenic-type clay, and usually results in a reduction of pore size without destroying permeability. 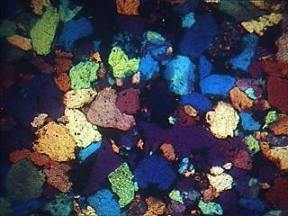 Other sandstones contain quartz grains with quartz overgrowths and pressure-solution contact features. 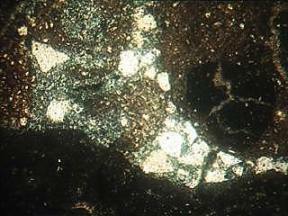 Kaolinite and illite are both present, but are located only as attached pore linings and do not appear to be present loose in the pore throats. In the siltstone members, there is less than 80% quartz and greater than 8% total clay. The small grain size of the quartz particles, the relatively high percentage of kaolinite and illite, and the presence of calcite cement all reduce or occlude the permeability of the rock. 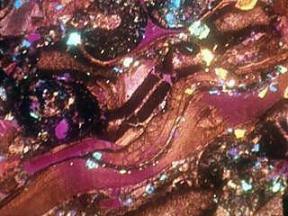 The illite in this rock type not only coats the kaolinite, but also blocks many of the pore throats. Mica and organic particles are usually preserved in this sand section, but no overgrowth or pressure-solution contacts of the quartz grains were observed. 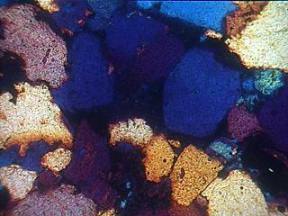 However, there is a definite direct relationship of feldspar to clay content, and also of both to the siltstone, calcite and dolomite content. The calcite and dolomite are found only in the siltstone and shale sections of both members. This sequence of deposition is indicative of a flood plain in which the main river channels are meandering and prograding in an upper deltaic environment. Channel cut and fill sequences are common in such an environment, and can be seen in many sections of cores and the interpretation of geophysical log responses. 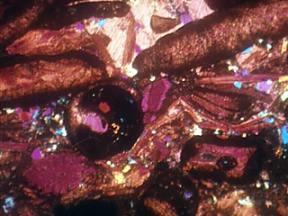 So, now you know how important a microscope is to the work of the geologist. It is a major investigative tool that helps us build our knowledge of the past.